Spectra-Physics® is an industry-leading supplier of advanced laser solutions to the microelectronics, solar, semiconductor, industrial manufacturing, scientific research, and life and health sciences markets for 50 years. Our portfolio of high performance, high reliability products includes a wide range of ultrafast, Q-switched DPSS, CW and quasi-CW, high-energy pulsed, tunable, diode and fiber-based lasers. Spectra-Physics is a leading manufacturer of cutting edge, highly reliable ultrafast lasers and amplifiers that enable breakthroughs in advanced scientific research, biological imaging and fine material processing. We offer a complete portfolio of turn key oscillators, ultrashort pulse seeders, high energy amplifiers as well as optical parametric oscillators (OPO), optical parametric amplifiers (OPA) and harmonic generators. With the largest and most experience global support team in the industry, Spectra-Physics is uniquely positioned to support your ultrafast application needs. Spectra-Physics leads the industry in innovation – including the first commercial ultrafast Ti:Sapphire laser. With our continued growth and recent acquisition of High Q Lasers, Spectra-Physics continues to extend its leadership position in ultrafast lasers. Quasar combines advanced fiber laser, power amplifier and patented harmonics technologies, to achieve breakthrough results. The design exploits the flexibility and robustness of fiber laser technology to enable TimeShift technology. Adding Spectra-Physics’ exclusive power amplifier technology, Quasar enhances this flexibility at unprecedented power levels. 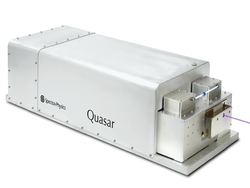 Finally, with Spectra-Physics’ patented harmonics, known for robust stability, Quasar is a breakthrough synergy of power, flexibility and control in a reliable 24/7 OEM laser for the most demanding applications. Spectra-Physics is a leading supplier of DPSS Q-switched lasers. Our lasers deliver superior reliability and are proven in demanding 24/7 industrial applications. With one of the broadest portfolios of Q-switched lasers in the industry and a deep applications expertise, we can help you find the right laser solution for your industrial applications. Spectra-Physics offers the industry’s most reliable high-energy, flashlamp- pumped Nd:YAG lasers for scientific and industrial applications. With the longest lamp lifetimes and highest quality construction, Spectra-Physics’ Quanta-Ray® lasers are backed by an industry-leading warranty and a global support team you can rely on. Combined with the broadest offering of high quality tunable solid-state OPOs and a dye lasers, Spectra-Physics has the high energy laser solution for the most demanding requirements. Spectra-Physics is the industry leader in high reliability, diode-pumped solid-state (DPSS) lasers for microelectronics, life and health science, industrial and scientific markets. Spectra-Physics’ continuous wave (CW) and quasi-continuous wave (Quasi-CW) lasers are built for 24/7 hands-off, reliable operation and low cost of ownership. With a broad selection spanning IR to UV wavelengths, power levels from mW to W, and CW and mode-locked quasi-CW, Spectra-Physics has the right laser solution for your most demanding applications. Spectra-Physics offers a wide range of tunable lasers for the scientific research and life and health science communities. Whether you need a high power CW tunable ring laser, a high energy pulsed solid-state or dye laser solution, or wavelength tunable ultrafast pulses, we offer a robust line of products that meet even the most stringent requirements. Together with state-of-the-art accessories and diagnostics, these lasers set the industry standard in the most demanding applications.